Ah, Purim. The holiday where we’re commanded to be happy. And to dress up. And to drink ’til you’re pleasantly buzzed. And to take gifts of ready-to-eat food (often sweets, but not always) to friends and family. Purim is the reason I don’t mind depriving my kids of halloween. It’s even better and more exciting because it’s for adults just as much as (or maybe even more than) for kids. I’ve decided that this year we’ll host our very first (annual?) Purim feast. Just us and a couple of other families, although that’s already quite a zoo (ten small children is a lot of children in a three-bedroom bungalow.) I have some major fun planned for the adults. The kids, not so much. They can make their own fun. I made them out of scraps that might otherwise have gone into the garbage; I can re-use them year after year (and for more than one type of occasion) instead of driving to the party store and buying paper streamers that will end up in the garbage. Incidentally, not having to go and buy decorations is a money-saver in a non-obvious way, too: I won’t buy all those little impulse items that are adorable but that I can really do without. It’s a win in so many ways – eco-friendly, cheap, beautiful, and always readily available. I think I’m in love. So, what are you doing for Purim? Leave me a comment! I love the streamers! What an amazing idea. Seriously, if you have enough scraps around you should think about selling some–as a non-sewer I would love them. Unfortunately not doing too much for Purim besides going to my daughter’s Purim concert. Erev Purim tend to be too late for the kid’s bedtime. But reading this inspires me…perhaps we’ll attempt to make some mishloach manot after school this week. I’m looking for things to do anyway. I am going to The Village Shul Carribean themed party!!!!!! I love the streamers. When I do parties and make holiday decorations I do everything I can to work with what I have or what I can find at goodwill instead of paying things new. I like to think it’s because I’m being eco-conscious and recycling, but it when it comes down to it, it’s because I just can’t afford to buy all that new stuff! Okay, and I may make myself sound really stupid…. but I’ve never heard of purim????? I was told that streamers were passé, and I refused to believe it. How can they be over if Target still sells them in the party aisle? 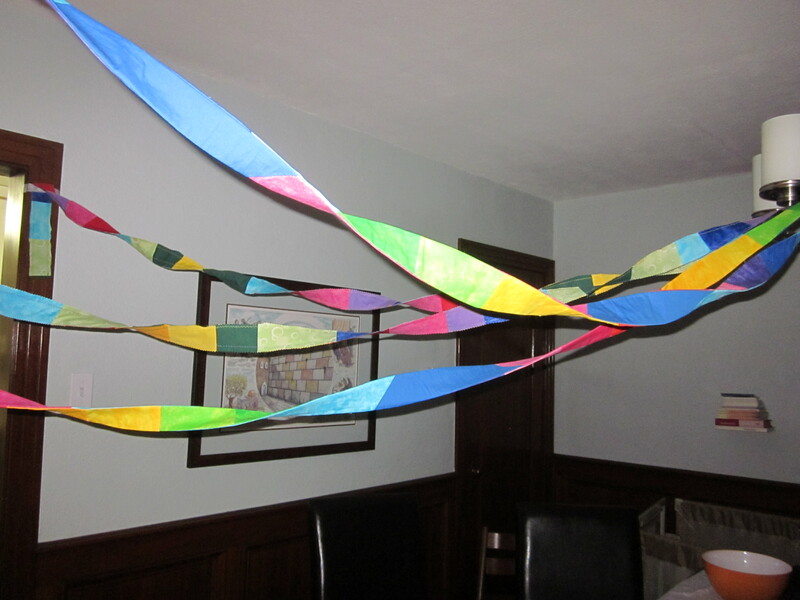 But these, these scrap-crafted, colorful streamers are fab. I especially like the finished edges. What a great idea. Your streamers are fabulous! I think I like the pinked ones better because a little more going on. Did you put anything inside them, like an interfacing or is it just two layers of fabric scraps sewn together? Thanks! I love the streamers too. To answer your question, there’s no interfacing. It’s just two layers of quilting-weight cotton sewn together and, in one case, turned and topstitched.